I was always fairly athletic growing up. I played tee ball and soccer growing up and eventually I stopped playing soccer and picked up basketball. Everyday after school I would come home, have a snack and head outside to dribble and shoot, play HORSE, around the world, or a few games of 1-on-1. As my teen years wore on, my dad came home one day with an old fashioned York Barbell Set. It came with a poster of some hand drawn bodybuilder type showing various exercises that could be done with the set. We set it up in the basement and I would mess around with it every so often but didn’t take it too seriously. Once high school ended and I got into my college years, I started to get into strength training more. I don’t know why. It wasn’t anything specific except a few of us had some free time and we decided to hit the gym in between classes. The “gym” at the community college I attended was tiny, but had a few benches, a rack of dumbbells, and a squat rack. The results came pretty quick. Not only had my strength increased, but also my muscle mass. Now take this within context. I was 5’5”, maybe 130 lbs right out of high school. Needless to say, my confidence skyrocketed as I started to get stronger and add some lean body weight. During this time, I also changed my major from Business Administration to Physical Education. I transferred to a 4 year school (Springfield College) and studied Health and Fitness. Once I started my studies at Springfield, I started getting into bodybuilding more and really started seeing some profound changes in the way my body looked. My routine was copied from whatever bodybuilding magazine I could get my hands on. It was usually Joe Weider’s Health and Fitness magazine, Ironman Magazine, and the occassional Muscular Development magazine. I was overtraining without realizing it because I copied the routine of a professional bodybuilder who was taking steroids to recover. I didn’t have that advantage. It wasn’t until my junior year in 1992 that the light bulb went on about the recommended sets and reps from a course based off of the American College of Sports Medicine (ACSM) Guidelines for Exercise Testing and Prescription. Suddenly everything made more sense. I reduced my training by one third to one half and my strength levels climbed steadily. With the reduction in training, I added another 5-10 lbs of muscle mass. I changed the routine a few times over the years, but the basics were the same. I was strong, I was athletic, and there was nothing I couldn’t do. I could play basketball for hours without getting winded, run up and down stairs, etc. My body could handle it without much of an issue. At first I believed it was because I was young and just had boundless energy, which certainly was a small part of the equation. Everything I was learning at Springfield was quickly put to the test when I did my internship at the Duke University Diet and Fitness Center (DFC) during the spring semester of ’93. It was my last requirement before graduating. I arrived a day before my internship officially began and I was shocked at what I saw. The DFC was a weight loss center, that much I knew. What I didn’t expect to see was a morbidly obese population. I was sheltered at Springfield. We were all in shape and looking to improve how our body looks or performs. The clients at the DFC had different reason for getting shape: weight loss for disease prevention, take control of their lives, and in some cases, not dying. Coming out of school, I was ready to teach everyone what I had learned. I quickly had to swallow my pride and realize my reality for what I learned in school was not reality for those who are obese and struggle to exist. Everything I learned at college was up for debate. The recommendations I had learned at school (30-40 minutes/day of cardio, 2-3 days/week of strength) would not work for this population. The overwhelming majority of the clients at Duke could not walk across the street to where they were staying without stopping a few times. Fortunately for me the fitness staff I was working with, took me under their wing and showed me the way to help these folks incorporate fitness into their daily lives. It was quite an eye opening experience to witness a person who had no hope to ever lose weight over the course of their stay lose significant weight and also improve their fitness levels 2-3 folds. To this day, I cherish my time at the DFC for the lessons I learned and the people I met. Oh, the stories I could tell….. 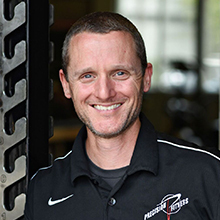 In the summer/early fall of ’93, I became a full time member of the fitness staff at Duke and during this time, the fitness industry started to drift from strength training to what was called “functional training”. It was an interesting time as stability balls became more popular and the industry bought into them hook, line, and sinker. The term has adjusted it’s definition over the years, but back in the 90’s it was about doing crazy balanced related exercises using the stability ball with weights. While the DFC didn’t go crazy with the functional training aspect, we changed our focus and started using the stability balls as part of the exercise classes we taught during the morning. We modified the exercises so the clients could do them and we saw really great results with the stability balls as they forced the obese population to use their bodies in ways they hadn’t used them before. When I was 25, I entered into a bodybuilding contest and realized that I hated being on stage. The other competitors were so serious back stage eating their raw potatoes and were ultra-focused on the competition. That wasn’t my style at all. I liked to be loose and have a little fun. I was definitely out of my comfort zone. After a little “soul searching, ” I realized I was burned out from bodybuilding and within a few weeks I did a 180o and went from bodybuilding into cycling/mountain biking. My strength training slowed down significantly, but I still did some of the “functional” strength training a few days per week. I had my parents send my road bike down and I started riding with a guy from work who used to do cycling and was at the time a marathon runner. We went out for a 30-35 mile ride and I felt great. The guy I rode with seemed surprised that I wasn’t sore or out of breathe. I guess he figured that I would fade quickly since I didn’t have a standard “aerobic base.” I will admit that when he pumped up the pace a bit, I couldn’t keep up, but again, this was literally my first time on a bike in probably 7-8 years. I started to realize that my bodybuilding workouts contributed significantly to my cycling performance. Had my strength levels not been at the level they were, I wouldn’t have recovered so quickly and certainly would’ve had more difficulty keeping up with him. With the functional training exercises I was doing as well, my strength levels were maintained for quite a while. Mountain biking was next in the que as it seemed like a natural phase that supplemented road cycling. Mountain biking is tough on the whole body. The trails can be brutal on the hips, shoulders, wrists, and neck. The roots, rocks, dips, and jumps forces the bike all over the place and the strength and stability needed to control the bike without getting beat up is extremely important. The strength that I had built through my experience in bodybuilding again proved to be a plus. I got involved in Mountain Bike Racing in the ’96 and my training time was spent mainly riding to work during the week and racing most weekends during the spring and into the fall until 2000. In 2004 my son was born and I stopped cycling as I wanted to spend time with him. Around this time another shift in the fitness industry happened. The National Academy of Sports Medicine (NASM) introduced their protocols designed to help personal trainers address clients needs through a program of foam rolling, stability training, strength, and power development. I had also started working for Precision Fitness and learned Bill’s protocol for starting every new client, which followed a similar model. It changed my way of thinking again. Now I wasn’t as focused so much on the crazy stability ball exercises as I was focused on self myofascial release (aka foam rolling), muscle activation, core activation, then strength. We still follow many of those protocols today, but also add in more mobility link while teaching the core fundamental movements for developing strength. As our family grew, I was spending less time in the gym and more time with my wife and kids. As a result my strength levels declined rapidly. However, as I re-started an exercise program, my strength would always come right back. The body is pretty amazing at rebounding and I am grateful to my experience with bodybuilding when I was younger as it has given me a fantastic foundation to stand on. As I have gotten older (I will be 49 this year), I realize that strength is vitally important and without it, I would not have been able to perform the way I have over the years. I truly believe that strength training has helped me look and stay youthful well into my 40’s. Yes my hair is starting to turn gray in spots, but I am happy I still have it. Currently I am not training for anything in particular, just loving training again. I enjoy being strong. It makes me feel powerful, like I can do anything. I really enjoy that feeling. The workouts themselves vary in intensity from tempo, strength, power, and hormone based workouts to make sure I am optimizing my time, and performance. Improves joint health through proper joint stability. Increases RMR (5 lbs. increase in muscle mass can increase your RMR upwards of 100 calories a day). As stated before, weight lifting isn’t just about lifting as much as possible. You need to decide how much strength you want to obtain for whatever purpose that extra strength is needed. Want to deadlift 200 lbs? Gain 5-10 lbs of muscle? Perform activities of daily living with better ease? Play with your grandkids? Perform your physical job better? Strength training can help do all of that for you. How do we decide how much strength we need? Setting goals is the easiest way to help guide you. Setting goals gives you a roadmap to guide you along with way to make sure you are heading in the right direction, and if not make the necessary adjustments along the way. Check out our blog post on goal setting to help you create a plan. Looking for a little more assistance to help you reach your goals? Hire a personal trainer to walk you through a training program so they can teach you how to do certain exercises. If a trainer is a little out of your budget, online training is a great alternative. Online training is another great way to have a trainer give you a great workout that you can do on your own time in your own gym. No matter how you get there, strength training has incredible value for you, especially as we get older. As we age, strength declines between 3-5% per decade. That is significant. Strength training can slow that rate down and allow you to maintain or possibly even build muscle as we age. Through my years of training, even when I was heavy into my cycling and mountain biking, I always missed my strength workouts. Looking back, had I not done that bodybuilding show, my enjoyment for strength training would have continued without a doubt. I don’t it if I would have done cycling or not, but I would’ve been involved in strength training some way. As my experience and understanding of how the body works grew, my relationship with strength training changed. In my 20’s, it was all about getting strong, muscular, and ripped (as it is for most young men who pick up weight training). In my late 20’s strength training was more performance based for cycling and maintenance of muscle mass. Now that I am in my late 40’s, I am strength training to have the energy to keep up with my kids and to slow down father time. He has rung the bell for me a few times, but I always slam the door in his face.